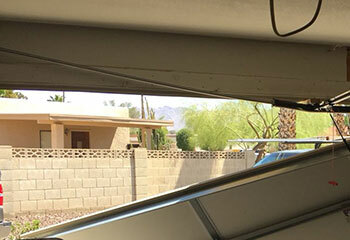 There is a wide range of problems that your automatic garage door can experience. But don't worry. Our technicians can take care of them all. Here are some of the projects that we completed recently. Customer Issue: Mrs. Noriaki’s belt drive opener stopped turning on at all, no lights coming on even when plugged in and connected. 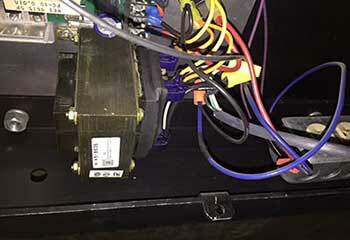 Our Solution: After unplugging the opener, our team opened it up and looked inside. Finding no problems in the circuit board or motor, they then inspected the power feed, and found a breakage at the power cord junction. They removed and replaced the cord, solving the issue. Customer Issue: Door nearly collapsed. Our Solution: The tracks were severely bent, which had caused a lot of the rollers to wear out and nearly made them slip out. We straightened the bending and replaced the problematic rollers, and then made sure that the door was able to move without any issues. Our Solution: We made sure the lift cables weren't damaged as well, and then we removed the old torsion spring from the shaft and installed a new unit in its place. 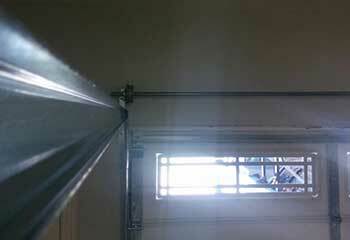 We then proceeded to adjust its tension and make sure the door opened evenly. 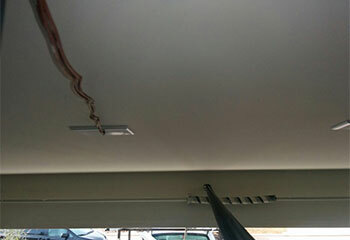 Customer Issue: Damaged garage door tracks. Our Solution: We discovered the root cause of the issue was some serious damage to the vertical tracks. After determining that replacing them was the correct and more efficient solution, we removed the old units and installed new ones in their place.